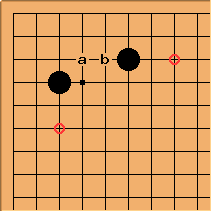 The 3-4 6-3 enclosure, also known as the large knight's move enclosure, has properties that are somewhere in between the 3-4 5-3 enclosure and 3-4 5-4 enclosure: it is faster than the territory-oriented 3453 enclosure; yet is itself more territory-oriented than the 3454 enclosure. Despite the differences, further development of the 3463 enclosure is very similar to that of the 3453 enclosure and 3454 enclosure, such as the double wing formation. However, the invasion and reduction techniques for the 3463 enclosure may differ from the other two types of enclosures. In modern professional play the large knight's enclosure has been less popular than the small knight's enclosure (by a ratio of about 1:4), but that may be changing in 2017. 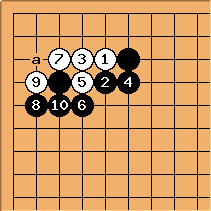 When the computer program AlphaGo played online as Master/Magister in the 2016/17 new year period it displayed a very strong preference for the large over small knight's enclosure (more than 10:1), as well as more unconventional ones such as the 3-4 6-4 enclosure, and since then it has become increasingly seen in professional games. Unlike the 3453 enclosure, this enclosure does not gurantee the corner territory. 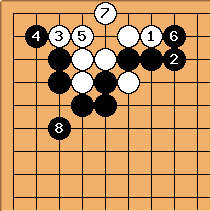 White can invade at a or b and live or escape. 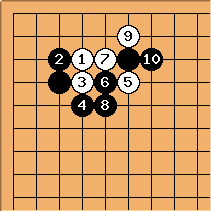 However, most of the variations are unfavorable for White. 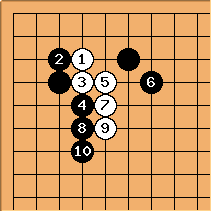 For the invasion to be a success White usually needs support on the outside, typically including a stone at one of the marked points.